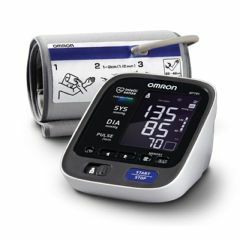 Allegro Medical presents the Omron 10 Series blood pressure monitor (BP785). The Omron 10 series upper arm blood pressure monitor has advanced features that provide users with detailed information to better manage their heart health. With a touch of a button, you can learn all you need to know about your blood pressure and be reassured you’re getting an accurate reading, thanks to the Calibration Check System and the Cuff Wrap Guide. Unit operates on 4 AA batteries (not included). monitor is ready to use whenever you are. Your BP785 Automatic Blood Pressure Monitor, excluding the arm cuff, is warranted to be free from defects in materials and workmanship appearing within 5 years from the date of purchase, when used in accordance with the instructions provided with the monitor. The arm cuff is warranted to be free from defects in materials and workmanship appearing within 1 year from the date of purchase when the monitor is used in accordance with the instructions provided with the monitor. The above warranty extends only to the original retail purchaser.